When I stepped into the Museum of Making, I was overwhelmed by a sense of awe and child-like wonder at all the working artifacts beautifully exhibited in a thoughtful manner. I also felt a deep down stirring and reminder of why I had studied engineering in the first place. 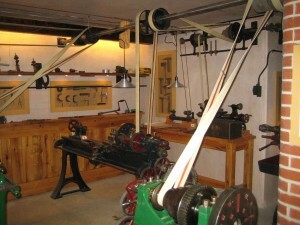 Power was transmitted from steam engine to machinery by a system of belts. We asked Ian MacGreagor, the proprietor of the museum, how he chose the people who worked with him to build the museum. He said quite simply, “I want to work with people who take care with what they do.” Apparently people he hires all intensely care about what they do whether it is metalworking or financial planning. This idea of taking care, of making sure that what you build or provide is of the highest quality possible, not based on other people’s standards or even your own standards, but by the standards of what is possible and needed. That’s real craftsmanship… an art perhaps muddied in today’s modern world of faster and cheaper. “I want to build something that lasts, so that others in the future can see something of quality,” explained Ian. How are we taking care with what we do so that future generations can have an example to be inspired by? A question worth pondering as I gaze at the massive horizontal steam engine of the industrial revolution. Next PostNext What makes a question powerful?